Growing up in a family were you're told every 1 April that there's a tiger, pink elephant, or something equal in the garden, you learn to dislike 1 April and April fools. When I joined Ravelry, a community for knitters and crocheters, I began liking it again. How can I not, when you get cute hats on 1 April? What got me really laughing today, though, was the Adblock extension to Google Chrome. 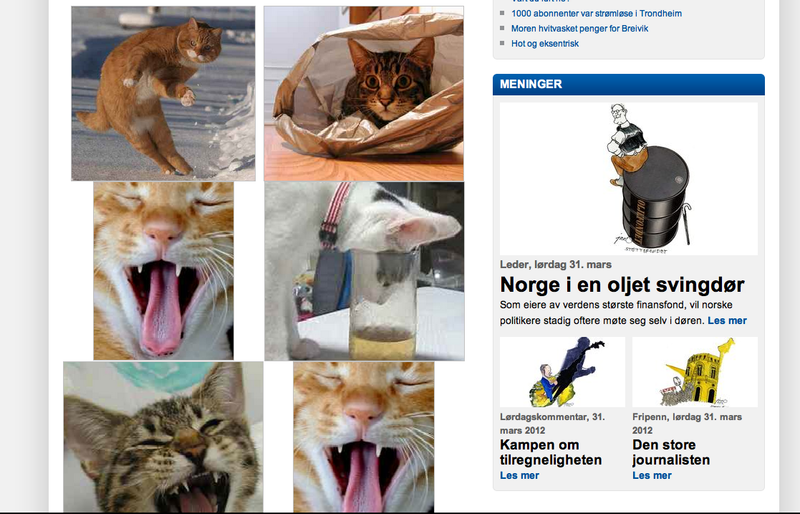 When I start my browser, I automatically start four panes of Norwegian newspapers, among other web pages. 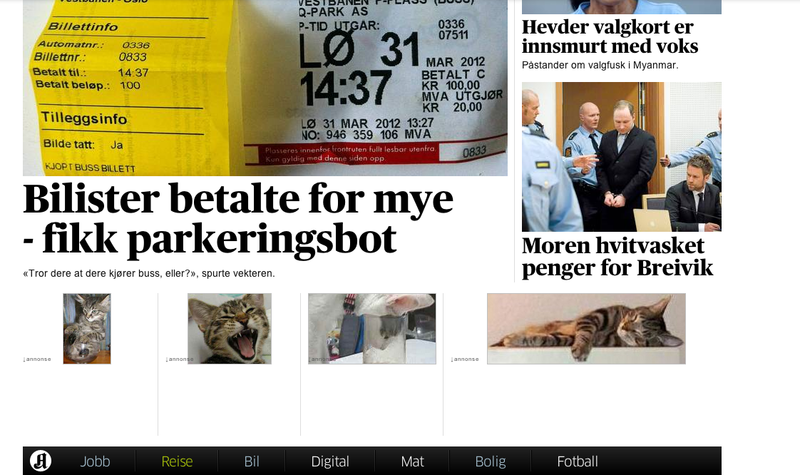 I saw pictures of cats in between the news articles, and was confused. What was this? I moused over one of the pictures, and got to this page. The ads were switched with cats! I love it! I've been laughing out loud several times because of this today, it's hilarious! This is the kind of April fools I like! More of these, please! I am playing around a bit with my background today, and the settings here, so if the blog looks a bit wonky, that is why. Hopefully I'll get it the way I want it soon, so that it looks better. Takk for det ;) Jeg synes du lager mye fint i strikking. Det er jo noe jeg slettes ikke kan. Prøver jo å lære meg å hekle men jeg hekler jo altfor stramt så ting må rekkes opp igjen og igjen. Så nå har jeg kjøpt meg mye større heklekroker, håper det hjelper.